Blood pressure(B.P) is the horizontal force exerted on the walls of arteries by blood. It is determined by two factors: cardiac output and peripheral vascular resistance. If both factors increase, blood pressure is also increased. Normal B.P of a person is 120/80 mmHg. When B.P is consistently​ equal to or greater than 140/90 mm Hg, this condition is called hypertension. Here are 140 systolic B.P (pressure in the arteries when the heart beats) And 90 diastolic B.P (pressure in the arteries when the heart relaxes). (1) Primary or essential hypertension - It's accounted for 90-95% cases of hypertension. The cause of this type is unknown. But Some risk factors related to are smoking, stress, obesity, heavy salt consumption, High fat diet, physical inactivity and familial history of high blood pressure. (2) Secondary hypertension- Causes of secondary hypertension are Renal diseases e.g.- renal artery stenosis, chronic Renal diseases, Hormonal disorder e.g.-Acromeglay, Cushing syndrome, hyperthyroidism, pheochromocytoma, cardiovascular diseases e.g. rigidity of aorta, Coarctation of the aorta, neurologic disorder e.g.- acute stress, sleep apnea. Hypertension is a chronic condition and usually does not have any symptoms.It is a silent killer because even in severe cases no symptoms appear and the patients with high blood pressure die due to brain stroke or other cardiovascular diseases. (1) Heart- Hypertension is the most common cause of life-threatening heart diseases such as ischemic heart diseases, left ventricular hypertrophy, Atherosclerosis, Cardiac arrhythmias. Increased workload on heart muscles because of hypertension leads to hypertrophy of left ventricle. Left ventricular hypertrophy increases the risk of coronary heart disease, stroke, and CHF. Hypertension is a major risk factor for atherosclerosis. (2) Brain- patients with hypertension have very high chances of death due to brain stroke. But in some cases brain stroke is nonfatal. Hypertension can impair cognitive functions and memory power in older persons. (3) kidney- Hypertension is a risk factor for the end-stage Renal disease. 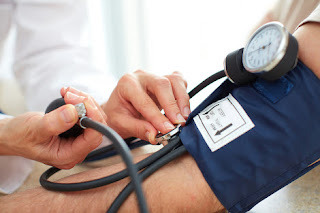 Kidney diseases also cause of hypertension. Hyperperfusion of glomeruli in hypertension causes glomerular capillary injury. (4) Eyes- increase pressure in vessels around eyes can cause Retinopathy. (1) weight loss- Reducing weight from physical exercise reduces blood pressure in obesity and reduces the risk of cardiovascular diseases. Blood pressure may be less than the slightest intense physical activity, such as fast walking, intense moderate workout. (2) dietary control- By reducing intake of fat-rich foods and increasing intake of DASH (Dietary Approaches to Stop Hypertension diet) vegetables, fruits, and low-fat dairy products, B.P decreases in people with high blood pressure within 8 weeks. fruits, vegetables, and dairy products are rich sources of potassium, magnesium, and calcium. (3) reducing daily salt intake reduces blood pressure in hypertensive persons. (4) reducing intake of alcohol in people who drink 2-3 drinks daily reduces blood pressure. (1) Diuretics- thiazides are used in combination with other antihypertensive drugs to treat Hypertension. Diuretics increase the excretion of water and sodium on acting kidney. e.g- chlorthalidone, Hydrochlorothiazide. (2) ACE inhibitors- ACEIs(angiotensinogen converting enzymes inhibitors) inhibit the production of angiotensin-∥( a potent vasoconstrictor) and increases bradykinin(vasodilator) level. These drugs are used with other antihypertensive drugs to treat the Hypertension.e.g- captopril, enalapril. (3) Aldosterone antagonist-Spironolactone and eplerenone are the drugs of this group. (4) beta blockers- Beta blockers decrease cardiac output and heart rate thus decreases the workload on heart.e.g- metoprolol, atenolol. (5) Renin inhibitors- Renin inhibitors Aliskiren inhibit the effect of enzyme Renin which involves in a mechanism which increases blood pressure. (6) alpha blockers- alpha blockers like prazosin, terazosin decreases peripheral vascular resistance and decrease blood pressure. (7) Calcium channel blockers(CCBs)- CCBs blocks L types of Calcium channels and decrease peripheral vascular resistance e.g- verapamil, diltiazem. (8) vasodilator agents- Minoxidil, Hydralazine decrease blood pressure by vasodilatory action on blood vessels. NOTE- Do not take these medicines on your own, consult your doctor before taking these.